I’ve chosen 6 tourmaline flat irons based on my own experience and other people’s reviews. I’m going to highlight all their best features so that you can find the best tool for you. And if there are some drawbacks, we will dig into them as well, since I’m trying to be objective and unbiased. Wonder which one to choose – the Chi Air 1 inch Tourmaline Ceramic Flat Iron or the Conair Infiniti Pro 1 Tourmaline Ceramic Flat Iron? I’ll help you to make up your mind! Also, we are about to explore the difference between various flat iron coatings. That is the kind of question I get asked a lot. Tourmaline flat iron VS ceramic flat iron – which one is better? And what’s so special about the titanium straightening iron? Let’s set the record straight. 1 Why are Tourmaline Flat Irons So Good? 2 Are there Any Drawbacks? 9 How to Choose a Tourmaline Flat Iron? 10 Tourmaline VS Ceramic Flat Iron: What are the Differences and the Benefits? 11 Titanium VS Tourmaline Flat Iron: What are the Differences and the Benefits? 12 Mixed Flat Irons Coatings: What are the Benefits? Why are Tourmaline Flat Irons So Good? First, let me remind you that usually, so-called tourmaline flat irons feature ceramic plates infused with tourmaline. This material emits negative ions when it’s heated up, and that helps to reduce frizziness and static electricity caused by positive ions. Tourmaline converts those positive ions into negative ones, making your hair smooth, shiny, and silky. Also, these negative ions lock in the moisture and allow you to straighten hair with less heat. 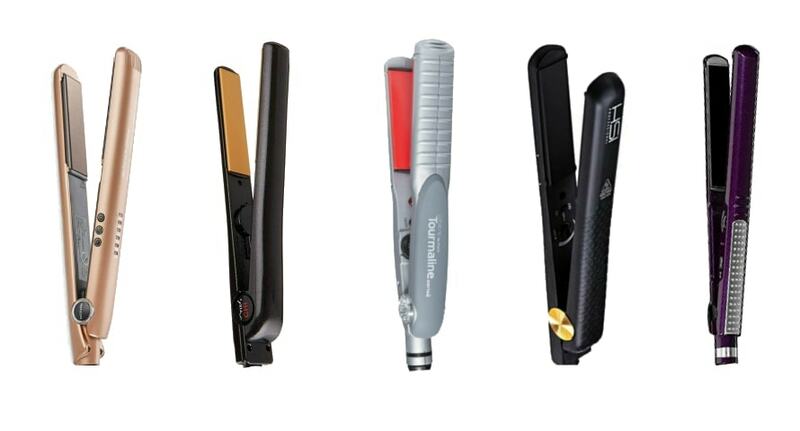 What’s more, tourmaline flat irons are considered to be a great straightening tool for all hair types. Just pay attention to the heat settings of the particular flat iron, especially if your hair is fine or damaged. In this case, you need to straighten your locks with minimum temperatures. So, enough talk! 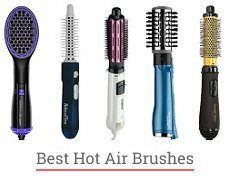 Here are the top 5 tourmaline flat irons I find to be the best of the kind. Looking for a fast and simple way to style your hair? This HSI ceramic tourmaline flat iron features 1-inch wide plates with curved edges which make it an excellent tool for both straightening and curling. You can select the heat level from 140°F to 450°F, so this black HSI tourmaline flat iron is suitable for all hair types. What’s more, it comes with a protective glove, a nice travel case, and a small Argan oil sample. 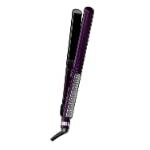 Coming in a slick purple design, this Infiniti Pro tourmaline ceramic flat iron features extra-long floating plates that will make styling even quicker. It heats up in only 15 seconds, and there are as many as 30 temperature settings. The highest heat of 455°F makes this Infiniti Pro Conair tourmaline ceramic flat iron a great tool for straightening even thick, coarse hair. It’s designed to protect your hair from damage and leave you with a shiny and smooth blowout. The only thing is, there are some Infiniti Pro Conair tourmaline ceramic flat iron reviews on Amazon where people complain about the poor performance of the tool. Maybe, they bought a fake. My experience with the Infiniti Pro by Conair tourmaline ceramic flat iron was pretty good. This NITION tourmaline flat iron features 1-inch wide floating plates infused with Nanosilver, argan oil, and tourmaline – the unusual, yet efficient mix. It makes your hair smooth and silky, helps lock in the moisture and avoids pulling or snagging the hair. There are 6 temperature settings, ranging from 300°F to 450°F, and the current heat level is shown on the LED display. This flat iron comes in a lovely rose pink design, and the package even includes a heat-resistant silicone end cap which is a nice supplement. the cord may feel stiff and inflexible. This CHI Air Expert Classic tourmaline ceramic flat iron is pretty much like the other CHI straightening irons, yet with several differences. For instance, it has a dial for adjusting the temperature. On the other hand, this CHI Air Classic tourmaline ceramic flat iron can’t maintain such high temperatures that other CHI models can. The latest innovative technology provides the even heat distribution which is always good. The tool warms up very fast, and the overall performance is great. As for the design, this CHI Air Classic 1 tourmaline ceramic flat iron is very similar to the other straightening irons of the brand. works well even on thick, coarse hair. This brand may not be that famous, yet their straightening irons proved themselves to be of the top-notch quality. They tend to work like clockwork for several years. Along with the Jilbere de Paris Tourmaline Series flat iron, there are ceramic and even porcelain flat irons of the same brand. 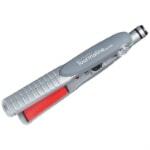 This particular tourmaline straightening iron comes in a creative grey design and has a good grip. It features 1.25-inch wide plates. The temperature is adjustable. With this flat iron, your hair will stay straight, shiny, and smooth even in humidity – isn’t that a dream? The temperature dial is limited, so it may be difficult to see whether you’re heating the tool properly. This flat iron features 1.5-inch wide plates that make it a handy tool for straightening long hair. It has a stylish grey design, but due to its shape, it can’t be used for curling. The grip is rather comfortable, and the plates feel very smooth. This flat iron straightens, smoothes, and eliminates frizz to leave you with shiny and soft locks. 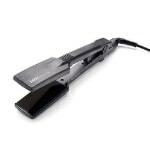 There is also the Sedu Pro ionic ceramic tourmaline flat iron which is ranked best flat iron on the market. For me, the Sedu professional straightening iron is good enough, too. the smooth plates prevent your hair from pulling or snagging. the on/off button is located inconveniently. How to Choose a Tourmaline Flat Iron? Choose a tourmaline straightening iron like you would choose any other styling tool – make some research, read other people’s reviews, and find out what brands are the most reliable. Seek advice from your stylist or friends who use a tourmaline flat iron. Consider your hair type, length, and overall condition. Pay attention to such features as the temperature settings, the maximum heat level, the width of the plates, the speed of heating up, and others. Remember that a good tourmaline straightening iron can’t be cheap because it’s quite an expensive material, yet there are plenty of affordable models on the market. Try to avoid fakes – purchase a tourmaline flat iron only if you know you can trust the seller. Tourmaline VS Ceramic Flat Iron: What are the Differences and the Benefits? Both tourmaline and ceramic flat irons have their benefits. For example, ceramic straightening irons warm up rather quickly, but that’s not their only strength. The heat is distributed evenly, meaning that you can straighten hair at a lower temperature, minimizing the damage. What’s more, their plates are smooth enough not to pull or snag hair. Flat irons can be solid ceramic or only ceramic-coated. In the second case, the results may turn out to be not so impressive since the heat distributes differently. What’s more, the coating will probably wear off as time goes by. 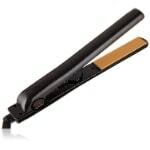 Tourmaline flat irons are good at reducing frizz and static. Usually, they feature ceramic plates infused with crushed tourmaline which adds an extra shine to your hair. Tourmaline straightening irons heat up very quickly, too. They work exceptionally well for coarse, wiry, and tightly coiled hair. Titanium VS Tourmaline Flat Iron: What are the Differences and the Benefits? Titanium flat irons are more powerful and heat up even faster than other irons. They are suitable for very curly, really thick and coarse hair that is hard to tame. Titanium straightening irons make such hair very straight and smooth. And if you have fine or damaged hair that is easy to manage, you probably want something less powerful. When using a straightening iron (no matter what the coating is), it’s especially important to reduce the damage that heat causes to your hair. 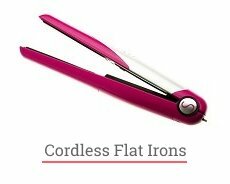 Cosmopolitan wrote about 10 flat irons that won’t fry your hair. Mixed Flat Irons Coatings: What are the Benefits? There are some models with a mixed coating such as ceramic tourmaline and titanium tourmaline flat irons. As for the first ones, their plates are usually made of ceramic infused with crushed tourmaline. This makes your hair softer, reduces frizz, and adds extra shine. For me, the best tourmaline ceramic flat iron is HSI. You can read my HSI Professional Ceramic Tourmaline Ionic Flat Iron review here. Combining tourmaline and titanium is rather sophisticated plate technology in the styling industry. 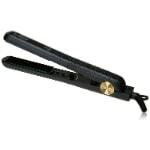 Tourmaline titanium flat iron maximizes benefits to hair, reducing frizz and making your locks really smooth and silky. For instance, you can achieve great results with the BaByliss Tourmaline Titanium Steam Flat Iron. As you can see, tourmaline flat iron is a great styling tool that not only makes hair shiny and smooth but also can reduce frizz and block out humidity. And some models can be used for curling, too! These are rectangular-shaped flat irons with curved edges – such as the Andis Tourmaline Nano Ceramic Flat Iron or the Red Ceramic Tourmaline Flat Iron by Kiss that features extra thin 0.5-inch wide plates. There are even smaller flat irons such as the Conair mini Pro Straightener. Flat irons with wider plates don’t work as good as a curling iron, but they are good at straightening really long thick hair. Personally, I like the Solia Professional 1.25-inch wide Tourmaline Ceramic Flat Iron and the Infiniti Pro Conair Tourmaline Flat Iron with 1.5-inch wide plates. And if you’re curious how long does it take to straighten long hair – we have the answer. 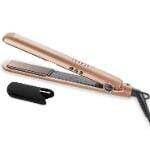 CHI flat irons are rather popular these days, and I use the CHI Tourmaline Ceramic Flat Iron from time to time. If you’re thinking about purchasing one, I’ve already written a detailed review on CHI straighteners, including CHI tourmaline ceramic flat iron. Finally, titanium tourmaline and ceramic tourmaline flat irons can be pretty useful. Each coating has its own benefits, so choose wisely depending on your hair type, length, and overall condition. I guess now you know a little bit about tourmaline flat irons, don’t you? And the only thing left to do is to wish you good luck in finding the best flat iron for you! Ladies, have you ever used a tourmaline flat iron? Which one do you find to be the most effective and useful? Leave your comments below!